 Showered, scrubbed, sat, fully dressed, in bed because the house is cold and from here I have a pleasing vista of leafy trees and sheep dots on field squares. Moorland squats under mist. The window has rain freckles. I hear a car rumble on the lane. Mr returns from his town errands, and he has bought a picnic basket in a charity shop. ‘Another bit of clutter,’ he apologises. 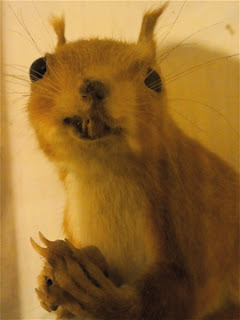 I look up at my family heirloom stuffed Red Squirrel, and decide I’d better not worry about it. Picnics are fun, even an indoor picnic on a day that rains. It is difficult to pack food in a basket without being mindful of the intention to share and enjoy. Once upon a time there was such a place as ‘Mr Potter’s Museum of Curiosities,’ a collection of objects including locally retrieved mummified cats, seventeen kittens drowned and stuffed to represent a Spring country wedding, a Victorian cucumber straightener and an umbrella stand made out of a hollowed elephants foot. 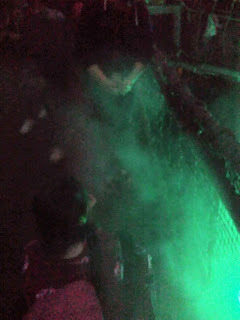 Compelling, disgusting, mind-bending stuff: one of my favourite places to visit, because it was so disturbingly weird. The grand finale was to wait in the gift shop space, watching the cctv screen, observing the mixed expressions and reactions of other visitors. Mr Potter’s collection has since been sold, as divided lots. Nothing I have discovered since has caused so much laughter and so much sickened revulsion in one afternoon. 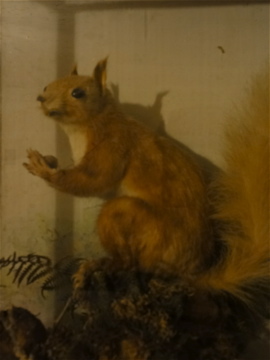 Red Squirrel, aka George. Probably about 70 years old. My childhood bf had a lot of real stuffed animals in her attic which used to scare the crap out of me as a kid. We were playing hide and seek once and accidentally broke a tail on one. Apparently red squirrel tastes awful but the prolific grey is delicious, and quite popular. An attic full of stuffed animals... that's some good childhood drama! I am so with you on the reasons for loving Squirrel.